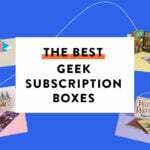 We asked our readers to name the best subscription boxes of 2019, and these are the results! Check out all of the awesome results here, or read on to see which snack subscriptions our community recommends most! Keep your pantry stocked with wholesome snacks, unique treats, and artisanal flavors with help from these snack subscription boxes! Our readers named their faves, including options for special diets, healthy eaters, and families. The Cost: $13.99 for a box of 8 single-serving snacks. Subscribe here! COUPON: Sign up here to get your first 4-snack sampler box free! Just pay $1 shipping. About the Box: Graze offers over 100 different healthy snacks in super-handy single-serve packages. It’s a fantastic option for families looking to pack lunches or stock up on wholesome treats that are great on the go. Each box selection is customized to your preferences, and includes yummy treats made with real fruit, nuts, and other feel-good ingredients! Read our Graze reviews to learn more. Ships to US and UK. The Cost: Plans start at $9.99 per box. Subscribe here! COUPON: Get your first box for $4.99! No coupon required—just sign up here! About the Box: Love with Food is a fave, thanks to its commitment to healthy snacks and serving its community—they donate to food banks with every box! Their boxes include snacks that are either organic, gluten-free, GMO-free, all-natural or free of artificial additives. Discover new favorite treats that meet your standards for ingredients and flavor! Read our Love with Food reviews to learn more. Ships worldwide. The Cost: $32.95 per month. Subscribe here! COUPON: Sign up here to get your first order of 5 full-size snacks for only $14.95! About the Box: NatureBox snacks are made from wholesome ingredients and are minimally processed with no artificial colors, flavors, or sweeteners. Nab the basic subscription for 5 snack bags per month, or join as a member to order whatever you like, whenever you like at a discounted members price. Read our Naturebox reviews to learn more. Ships to US and Canada. The Cost: Plans start at $29.99 per month. Subscribe here! COUPON: Save $20 off your first month when you sign up here! About the Box: Candy Club sends about 3 pounds of classic and quirky candies per shipment, including a mix of gummies, sour candy, and even chocolate. It’s the perfect way to keep your office snack drawer well-stocked! Check out all of our Candy Club reviews to learn more. Ships to US only. The Cost: Choose between the Yum Box for $14 a month or the Yum Yum Box for $25 a month. About the Box: Universal Yums sends you snacks and candies from a different country each month. Each box comes with a scorecard, so you can keep track of which snacks you love most. There’s also plenty of information about the country, too, so you can learn while you enjoy in some delicious treats! Read our Universal Yums reviews to learn more. Ships to US, Canada, UK, and Israel. The Cost: Plans start at $14.00 per month. Subscribe here! About the Box: Take your taste buds around the world with Snack Crate! Each month you’ll get global goodies from a specific country. Choose one of several subscription sizes—pick the pack that fits your appetite! Read our Snack Crate reviews to learn more. Ships to US and US territories. The Cost: Plans start at $24.50 per month. Subscribe here! About the Box: ZenPop sends you Japanese ramen and sweets, handpicked by their staff in Japan. It’s a great way to try snackable and more substantial treats from Japan. Check out their Beauty and Stationery boxes, too! Check out all of our ZenPop reviews to learn more. Ships worldwide. About the Box: Each month of the Vegan Cuts Snack Box comes packed full of vegan and natural foods and snacks. In addition to small snacks, you’ll also get ingredient-conscious supplements and pantry staples. Read our Vegan Cuts Snack reviews to learn more! Ships worldwide. The Cost: Plans start at $25.00 per month. Subscribe here! COUPON: Use code ADDICTION to save $10 off your first box. About the Box: Bokksu is a “grown-up” Japanese candy box. With each box, you’ll receive premium, authentic Japanese snacks as well as a tea pairing to complement the featured flavors of the month. Often, the snacks are from smaller companies or reflect more traditional Japanese flavors. Read all of our Bokksu Reviews to learn more. Read all of our Bokksu reviews to learn more. Ships worldwide. The Cost: Plans start at $21.50 per month. Subscribe here! About the Box: SnackSack is a fantastic way to learn about delicious new ingredient-conscious snacks! Choose a classic, vegan, or gluten-free membership to start receiving 12 new snacks each month, all following a certain season or theme. They also offer a larger workplace option if you’re looking to stock your office! Read all of our SnackSack reviews to learn more. Ships to the US. The Cost: Plans start at $22.50 per month. Subscribe here! About the Box: Japan Crate helps you explore the quirky world of Japanese snacks! Each month, they send subscribers a wide variety of snacks and candies direct from Japan. The Premium box always includes one soda-type drink and a super fun DIY candy kit, too. Check out all of our Japan Crate reviews to learn more. Ships worldwide. The Cost: Plans start at $19.99 per month. Subscribe here! COUPON: Use code KETOADDICTION to save $5 off your first box! About the Box: Stock up on snacks that fit your ketogenic diet with Keto Krate! With each box, you’ll discover 8+ keto-friendly products, including savory snacks and even keto sweet treats. Check out our Keto Krate reviews to learn more. Ships to US. The Cost: Plans start at $14.99 per month. Subscribe here! COUPON: Use code TREATYOURSELF to save 10% off your first box. About the Box: Chocolate and cheese Pocky? Sweet potato gummies? Each TokyoTreat box comes with a variety of Japanese snacks to try, including dagashi, quirky flavors, and seasonal favorites. Read our TokyoTreat reviews to learn more. Ships worldwide. Craving more snack subscription box ideas? Check out our editors’ favorite snack and candy subscription boxes here! The Cost: Plans start at $9.95 per month. Subscribe here! About the Box: Yummy Bazaar sends you snacks and pantry items from around the world! You’ll get a mix of sample-size or full-size items from a handful of different countries with each box. Skip a month if your kitchen is already stocked up, and earn points to put toward more of the products you really love. Yummy Bazaar also offers two subscription levels—choose the size that matches your appetite for adventure! Read our Yummy Bazaar reviews to learn more. Ships to US. The Cost: Plans start at $9.99 per month. Subscribe here! COUPON: Get the 6 snack box for just $1 plus shipping! No coupon required—just use this link! About the Box: SnackNation makes healthier snacking more fun! Each box features snacks with no artificial colors, sweeteners, or flavors. Plus, they have a partnership with Feeding America to support families in need! Check out our Snack Nation reviews or Snack Nation info to learn more. Ships to US. The Cost: Plans start at $12.95 per month. Subscribe here! COUPON: Use code ADDICTION to save $2 off your first box. About the Box: MunchPak delivers a world of global treats to your doorstep! Select your box size, or customize the contents for an additional fee. See what snacks other countries consider familiar favorites—they might become your favorites, too! Read our MunchPak reviews or MunchPak info to learn more. Ships worldwide. The Cost: $49.95, every other month. Subscribe here! About the Box: Boxwalla’s thoughtfully curated collections of artisanal foods introduce you to a new set of small-batch and gourmet brands each month. The bi-monthly boxes center around a new theme with each shipment, and the boxes themselves are packaged in eco-friendly, reusable boxes. Read our Boxwalla Food Reviews and check out their other boxes for film, books, and beauty. Read our Boxwalla Food Reviews and check out their other boxes for film, books, and beauty. Ships worldwide. You say that Love with Food starts at $9.99 per month. It’s over $10 more than that according to your link. It looks like the link goes to the gluten free option. Sorry about that! We’ve updated the link, thanks for letting us know! Surprised to see that Graze is #1. I used to subscribe and the snacks were bland to me. I tried to like Candy Club but they sent me too many sour candies even though I stated on my profile that I preferred sweet. Snack Nation has GREAT customer service!